BI2536 is a potent Plk1 inhibitor with IC50 of 0.83 nM in a cell-free assay. It shows 4- and 11-fold greater selectivity against Plk2 and Plk3. Phase 2. (C) HeLa cells were treated with inhibitors of Aurora B (hesperadin), Aurora A (Aurora A inhibitor I), CDK1 (roscovitine), or PLK1 (BI2536) for 2 hours before immunostaining for tubulin and phosphorylated RV[S/T]F (p-RV[S/T]F). Nuclei are indicated with DAPI. Control cells were not treated with any inhibitor. More than 50 cells were imaged for each condition in three independent experiments. Scale bar, 20 μm. Science, 2018, 11(530), doi: 10.1126/scisignal.aai8669. BI 2536 purchased from Selleck. Comparison between Genetic Ablation of Cdc20 and Current Mitotic Drugs (C) Transformed Cdc20(lox/lox); RERT(+/Cre) MEFs were subcutaneously injected into the two flanks of SCID mice, and tumors were scored every 2-3 days.These mice were injected i.p. (three injections per week) with 4-OHT or mitotic drugs (taxol, vincristine, and BI2536) when tumors reached about 200 mm3 of volume (day 11; arrow) (n = 8 mice per group). (D) Representative images of these fibrosarcomas 3 days after injection with 4-OHT (to generate Cdc20(D/D) cells), BI2536, or taxol. These mice were injected with 10 μM BrdU to score DNA replication. CA3, immunodetection of active caspase 3. Scale bars, 50 or 10 μM (insets). Cancer Cell 2010 18, 641–654. BI 2536 purchased from Selleck. (a,b) RPE1 cells transfected with control or either of two B56-PP2A siRNA pools (1, 2) were incubated in MG132 (10µM, 15 min), followed by the addition of BI2536 (40 nM) or DMSO for 45 min. (a) The frequency of mitotic cells with few or absent cold-stable K-bres . (b) Maximum-intensity projection of tubulin (green) and an overlay with kinetochores (CREST, red) in B56-PP2A-siRNA (pool 2) cells treated with DMSO or BI2536 (40 nM). Insets are 3 enlargement of the optical sections spanning the outlined centromeres. Nat Cell Biol 2011 13, 1265-71. BI 2536 purchased from Selleck. (a) HeLa Tet-On cells were treated with the indicated siRNAs, arrested in mitosis using 500 nM nocodazole (Noc) and 10 μM MG132, and then treated with or without BI 2536. The endogenous Cdc20 was immunoprecipitated from these cells and blotted with the indicated antibodies. The mitotic index of each sample is indicated below each lane. The bottom graph shows the quantification of the Cdc20-pS92 signal normalized to the total Cdc20 signal (mean±range; n=2 independent experiments). Nat Commun, 2016, 7:10818. BI 2536 purchased from Selleck. Treatment with BI 2536 induces cell-cycle arrest in NB TICs and aberrant accumulation of cyclin B1 and p21. C, expression of cyclin B1 and p21 was assessed in NB88R2 following 16 and 24-hour treatment with different doses of BI 2536 (10, 30, and 100 nmol/L). ERK1 (extracellular signal regulated kinase 1) was used as the loading control. D, inhibition of PLK1 was assessed by in vitro kinase assay following treatment of NB88R2 for 3 hours with BI 2536. Cancer Res 2011 71, 1385-1395. BI 2536 purchased from Selleck. Treatment with BI 2536 induces cell death via apoptosis. A,treatment with BI 2536 (10, 30, and 100 nmol/L) reduces viable cell numbers as assessed by trypan blue exclusion. B, representative Western blot demonstrating accumulation of cleaved PARP following treatment with 10 nmol/L BI 2536. BI 2536 inhibits NB tumor growth in vivo. A and B, NOD/SCID mice bearing 50- to100-mm3 tumors were injected intravenously with either vehicle (0.1N HCl per saline) or 12.5 to 25 mg/kg BI 2536 for 2 consecutive days a week, for a total of 3 cycles.Two independent experiments were performed in each case with 5 animals per group. Representative tumor growth data are shown. animals with 50- to 100-mm3 tumors were randomized into 4 groups: group 1 injected intravenously with vehicle (0.1N HCl per saline), group 2 injected intravenously with 12.5 mg/kg of BI 2536 (2 consecutive days, 3 cycles), group 3 injected i.p. with 10 mg/kg of irinotecan (3 doses total, 3 days apart), and group 4 injected with BI 2536 and irinotecan. Both representative tumor growth data and a Kaplan-Meyer survival plot are shown. Plk-1 knockdown and inhibition by BI 2536 and viability of human melanoma cell lines M14 and WM-115 as demonstrated by MTT assay. Experiments were performed in triplicate. One representative experiment is shown. *P<0.001, ANOVA test with Tukey’s post-test. ANOVA, analysis of variance; MTT, 3-(4,5 dimethylthiazol-2-yl)-2,5-diphenyltetrazolium bromide; Plk-1, polo-like kinase 1; siRNA, small-interfering RNA; WB, western blot. J Invest Dermatol 2011 131, 1886–1895. BI 2536 purchased from Selleck. Western blot analysis of the expression and phosphorylation of Plk1, and phosphorylation of Myt1 in the CSC-like cells after treatment with BI 2536 for 24 and 48 hours, respectively. Oncotarget, 2017, 8(23):37633-37645. BI 2536 purchased from Selleck. Cells with decreased GRK5 expression are more sensitive to PLK1 inhibition.A , shown is cell death in control or GRK5-shRNA stably transfected cells after 72 h of treatment with 0-120 nM BI 2536 as determined by trypan blue exclusion (n = 6).B , shown is cell death in control or GRK5-shRNA stably transfected cells after 72 h treatment with 0 –120 nM GSK461364, as determined by trypan blue exclusion ( n = 4). J Biol Chem 2012 287(21), 17088-99. BI 2536 purchased from Selleck. J Biomol Screen 2013 18(1), 54-66. BI 2536 purchased from Selleck. 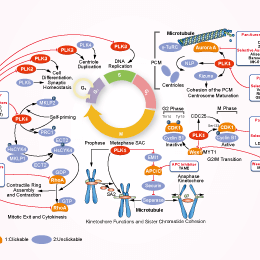 The first potent and selective Plk1 inhibitor that induces all hallmarks of Plk1 inhibition. Recombinant human Plk1 (residues 1-603) is expressed as N-terminal, GST-tagged fusion protein with a baculoviral expression system and purified by affinity chromatography with Glutathione-agarose. Enzyme activity assays for Plk1 are performed in the presence of serially diluted BI 2536 with 20 ng of recombinant kinase and 10 μg casein from bovine milk as the substrate. Kinase reactions are performed in a final volume of 60 μL for 45 minutes at 30 °C (15 mM MgCl2, 25 mM MOPS [pH 7.0], 1 mM DTT, 1% DMSO, 7.5 mM ATP, 0.3 μCi γ-33P-ATP). Reactions are terminated by the addition of 125 μL of ice-cold 5% TCA. After transfer of the precipitates to Multi-Screen mixed ester cellulose filter plates, plates are washed with 1% TCA and quantified radiometrically. Dose-response curve is used for calculating IC50 value. Cell lines: HeLa, A43, SKOV-3, HT-29, K562, A549, Saos-2, MCF7, HCT116, COLO 205, Hep G2, Raji and PC-3 cells, etc. Method: Cells are exposed to various concentrations of BI 2536 for 24, and 72 hours. Cell growth is assessed by the measurement of Alamar Blue dye conversion in a fluorescence spectrophotometer. For determining the DNA content of the cultures, cell suspensions are fixed in 80% ethanol, treated for 5 minutes with 0.25% Triton X-100 in PBS, and incubated with 0.1% RNase and 10 μg/mL propidium iodide (PI) in PBS for 20 minutes at RT. Cell-cycle profiles are determined by flow cytometric analysis. Steegmaier M, et al. Curr Biol, 2007, 17(4), 316-322. Nappi TC, et al. Cancer Res, 2009, 69(5), 1916-1923. We need to use BI 2536 in preclinical studies using mice, how to formulate the inhibitor for this in vivo study? GSK461364 : Plk1-selective, Ki=2.2 nM. Rigosertib (ON-01910) : Phase III for Myelo Dysplastic Syndrome (MDS). Ro3280 New : Potent, highly selective inhibitor of Polo-like kinase 1 (PLK1) with IC50 of 3 nM. Volasertib (BI 6727) : Highly potent Plk1 inhibitor with IC50 of 0.87 nM and in phase II trials. SBE 13 HCl is a potent and selective PLK1 inhibitor with IC50 of 200 pM, >4000-fold selectivity over Aurora A kinase, Plk2 and Plk3. CCG-1423 is a specific RhoA pathway inhibitor, which inhibits SRF-mediated transcription. Rigosertib (ON-01910) is a non-ATP-competitive inhibitor of PLK1 with IC50 of 9 nM in a cell-free assay. It shows 30-fold greater selectivity against Plk2 and no activity to Plk3. Phase 3. HMN-214 is a prodrug of HMN-176, which alters the cellular spatial orientation of Plk1. GSK461364 inhibits purified Plk1 with Ki of 2.2 nM in a cell-free assay. It is more than 1000-fold selective against Plk2/3. Phase 1. Features:Demonstrates >390-fold selectivity for Plk1 relative to Plk2 and Plk3. Volasertib (BI 6727) is a highly potent Plk1 inhibitor with IC50 of 0.87 nM in a cell-free assay. It shows 6- and 65-fold greater selectivity against Plk2 and Plk3. Phase 3. Features:A high volume of distribution, indicating good tissue penetration, and a long terminal half-life. MLN0905 is a potent inhibitor of PLK1 with IC50 of 2 nM. RO3280 is a potent, highly selective inhibitor of Polo-like kinase 1 (PLK1) with IC50 of 3 nM. 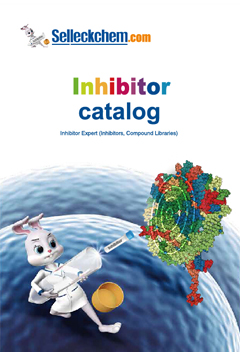 Features:A selective PLK1 inhibitor. Demonstrates greater potency than BI2536. Potential use in nasopharyngeal carcinomas. NMS-P937 (NMS1286937) is an orally available, selective Polo-like Kinase 1 (PLK1) inhibitor with IC50 of 2 nM, 5000-fold selectivity over PLK2/PLK3. Phase 1.